Federal drug survey reports older cannabis users driving increase. 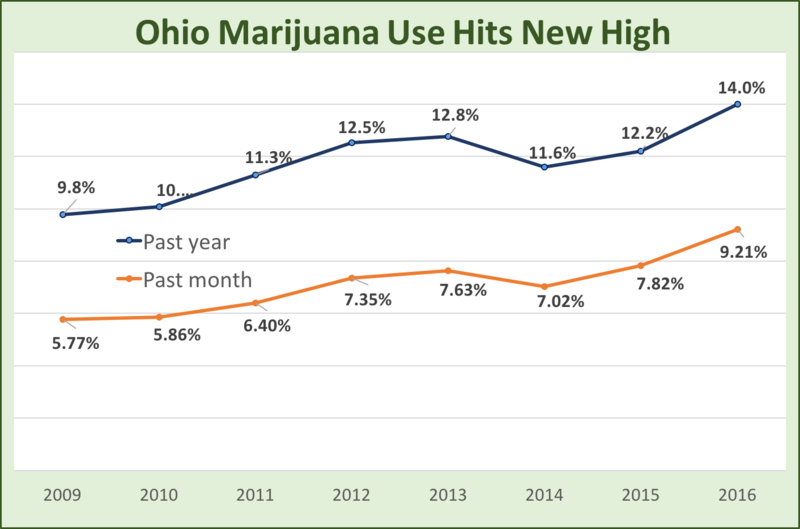 Adult marijuana use in Ohio soared to what is likely a record level in 2015-16, according to a new federal report issued quietly this week. The annual National Survey on Drug Use and Health reported that 1,235,000 Ohioans ages 18 and older reported using cannabis at least once in the previous 12 months in a survey covering 2015 and 2016. That was a jump of 160,000 Ohio adults over the previous federal survey, which covered 2014 and 2015. The survey found 14.0% of Ohio adults said they’d used marijuana in the previous 12 months, up from 12.2% one year earlier and 9.8% back in 2008-09. Adult marijuana use is at or near the highest ever recorded, although it’s not possible to say for certain if this is a record because surveys were done slightly differently in the 1970s and 1980s. Teen marijuana use remains low, less than half the level of the 1970s and 1980s. Today’s cannabis popularity is a grown-up thing, with gray-haired adults driving the trend. 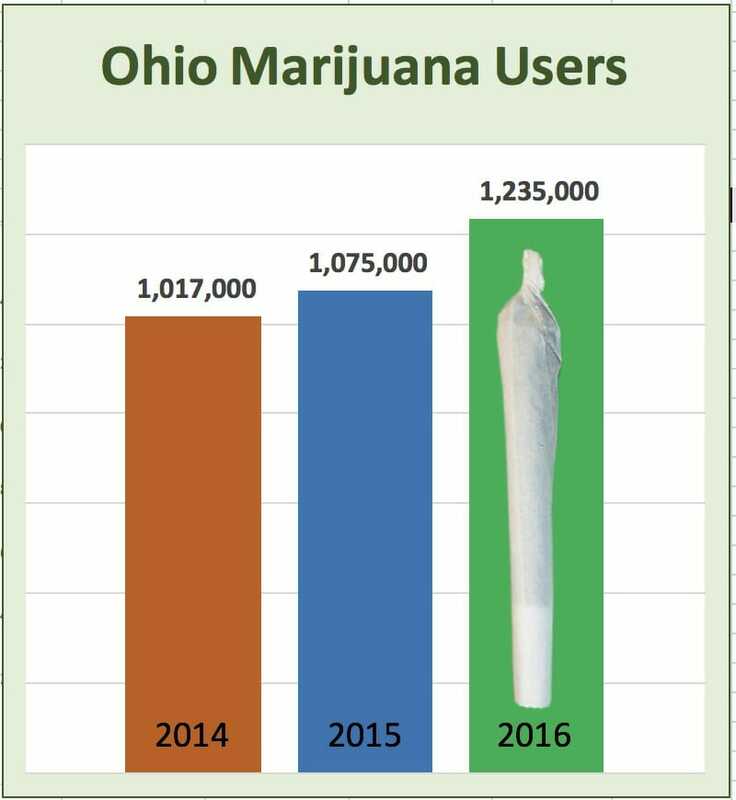 Of the 160,000 new Ohio cannabis users, 151,000 were 26 and older. A detailed age breakdown for Ohio in the 2015-16 survey are not available but results from the survey’s national data show that people 50 and older are driving much of the increased use. The survey doesn’t ask why people smoke marijuana, so it’s unclear how much of the additional cannabis use is recreational and how much is medicinal. The introduction of fentanyl into Ohio’s illegal drug supply could be causing a move to marijuana’s safety: Virtually all Ohio marijuana is grown in-state or imported from legal marijuana states, ensuring that cannabis is fentanyl-free. Teen use increased in 2016, the federal survey found, although less than adult use. An estimated 109,000 Ohio youths ages 12 to 17 smoked marijuana at least once the previous year, up 4.9% from a year earlier. By contrast, adult use was up 14.9%. The number of adults using marijuana in the previous month also increased significantly. Past-month adult marijuana users rose from 688,000 in 2014-15 to 813,000 in 2015-16, an 18.9% increase, the federal survey said. The raw data for state level estimates is here. I use it and, it litterly replaces 5 of the medications that my doctor assigns to me that present nasty side effects. Let’s really be honest with ourselves. The at least “once a year” rates are nearly identical. The “willing to admit it on a government form because it has risen among the once a month or more” rates have risen. I’m sure there’s increase but not the way it’s being portrayed.